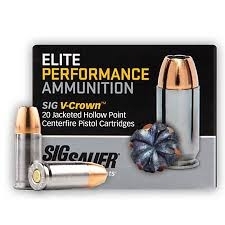 SIG SAUER Elite Performance Centerfire Pistol Ammunition, with V-Crown Jacketed Hollow Point bullets, is designed to provide superior accuracy, reliability, and performance in a personal defense round. The SIG V-Crown stacked hollow point design provides a smaller additional hollow point cavity behind the main cavity. This design, along with V-shaped jackets skives and scores provides controlled, uniform expansion at all effective distances and velocities. The SIG SAUER Elite Performance V-Crown bullet has a unique toothed cannelure located halfway up the shank of the bullet to more effectively lock the jacket and core. This feature provides exceptional structural integrity in a jacketed design, ensuring maximum weight retention and outstanding terminal performance. A nickel plated brass case reduces corrosion, enhances lubricity, and improves feeding and extraction.